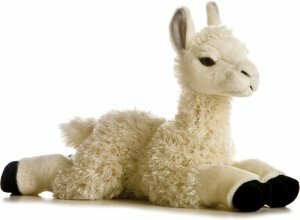 SALE: $15.50 This sweet alpaca has short, soft white fur and a beautiful face. Ears are long and stand upright, measuring approximately 12 inches in length! These plush animals are bean filled and they have lock-washer eyes and noses for safety. (Regularly $16.95). Note: the hang-tag says: "Llama". Often in Peru, the term "Llama" includes not only llama but their cousins, the alpaca. We think it looks like an alpaca. We hope you enjoy! Composition: Made with all man-made materials; polyester fibers, and plastic pellets stuffing. Surface is washable. For the manufacturers written assurance of its compliance with theConsumer Product Safety Improvement Act and its record of safety, click to download CPSIA Compliance Statement, And their Certificate of Compliance for our products are available for download. Click Here.